Pond’s Pimple Clear Targets Pimples Face Wash targets pimples at their root cause and helps protect skin from future break-outs. 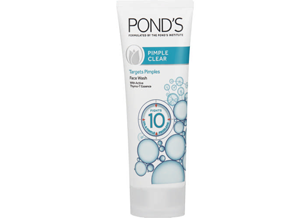 Use together with the Ponds Pimple Clear Leave On Gel for optimum results. Availability: Clicks stores and online. This multi-action facial foam and scrub is designed to control oil, clear pimples, reduce blemishes and redness, as well as to tighten pores, calm the skin, remove blackheads and whiteheads and smooth and brighten skin. Washes off make-up instantly. This face wash smells really good and it’s soft on the skin. My mother, sister and I started using this last year December and we love this product . The softness of the skin is unbelievable This face wash can be used 3 times a day. It does wonders to your skin . Available from major retailers. R 6.99 for 15ml, R 32.99 for 50ml and R 49.99 for 100ml. When I first tried this product I asked my husband and teenage daughter try it with me. So this review is basically from all 3 of us. Hubby shaves his head and sometimes does get the odd pimple afterwards here and there. This product worked like a bomb! Best product for pimples – by day 3 its dried out. Daughter used it and at the time had a pimple on her nose (yes the worst kind – we’ve all been there). Same result – by day 3 its dried out. Works must faster that other product claiming to clear pimples. At the time I didnt have any major pimples to talk about. I usually get tiny red dots which cleared up much quicker (totally understandable) then the pimples of the other two mentioned above. This is a great product for pimples and when I need to purchase a pimple-fighting product again. I will most certainly buy this. The only negative thing I can say about this product is that it does not have the best of smells. But for the purpose that it is made for and it’s impact, this can be overlooked. This product works well with the Pond’s Clearing Gel. I have used this scrub for a month and it works amazingly. My skin is not as oily as it used to be before. Its best used with Ponds Perfect Complex face cream (Normal to Dry).